Earlier this week I made a daytrip to the Swedish capital – Stockholm. Stockholm is a city with about 1 million inhabitants (1,4 million if you count the suburbs) and it spreads over two sides of Lake Mälaren and some islands in between. My favorite part of Stockholm is Gamla Stan (the Old Town) and this is where I spent most of my time. A tradition for me, when visiting Stockholm, is to visit The Royal Coin Cabinet a museum dedicated to currency and of course coins. I go there either to visit the museum or to get my hands dirty among the random coins that are for sale. I often leave the museum with a couple of new coins that I’ve found. Here are some photos from The Royal Coin Cabinet. The entrance to The Royal Coin Cabinet. Its Swedish name is Kungliga Myntkabinettet. The museum is located next to the Royal Palace. This is the resident of the Swedish King and Queen. It’s in this chest that I get my hands dirty when looking for coins that I want for my collection. Coins from the classical antiquity – ancient Greece and Rome. A piece of Swedish plate money from the 17th century. Sweden had the largest copper production in Europe at the time. In order to have coins that matched the value of silver they were made into these huge pieces of metals with stamps showing their value. This is a 1 daler “coin”. And this piece of plate money is considered the largest coin the world (that has actually been used to pay with). This one is also from the 17th century and it’s extremely heavy. I tried to lift one and I barely managed it. Coins and banknotes from all over the world. This little boy is found in a small courtyard near the coin cabinet and he’s often referred to as “Iron boy” or “Boy that looks at the moon”. It’s common for tourists and visitors to stroke him over the head and leave a coin by him (the coins are later collected for charity). This day there were a lot of rubles and euros. Someone had also put a hat on his head so he wouldn’t freeze. If you want to know more about The Royal Coin Cabinet you can follow this link! Wolfgang Amadeus Mozart (1756 – 1791), possibly the world’s most famous representative of classical music, is featured on this Austrian euro coin. Mozart’s signature is also featured and I think this is a very nice touch. Under the text EURO next to Mozart you have the outlines of a flag. If the striped areas would be colored red and the smooth area white you’d have the Austrian flag. Mozart, born in Salzburg, is a huge symbol of the country, and he’s present almost everywhere – in statues, landmarks and in souvenirs. This is something I experienced this summer when Vienna was one of the European capitals I visited. So I’ve been in Austria, but I actually got this coin in Italy. 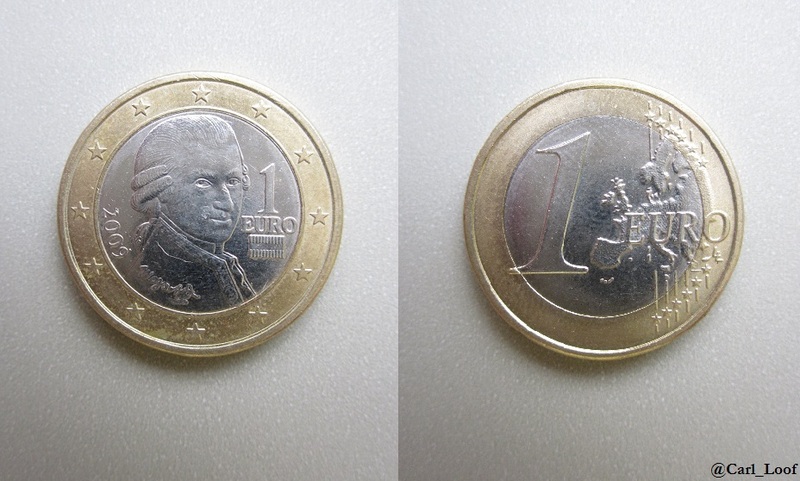 The euro coins have special motifs on one side, representing one of the countries, but they are spread all over the euro zone. A good friend of mine is a musician and I would think that this is his favorite coin of all time. He also got one in Italy, but he lost it when he wasn’t thinking about which coin he paid with. Good thing I managed to get another for him later. The euro replaced the Austrian schilling in 2002. This is one of two common designs of the Ukrainian 1 Hrivnja coin. The text that reads YKPAÏNA (Okraina) is the name of Ukraine in Ukrainian and above the name you have a trident in the country’s coat of arms. This trident (sometimes also interpreted as a hawk) dates back to the medieval ages. The trident is also strongly connected with Volodymyr Velikij (Vladimir the great) and it is he who is featured on the other side of the coin. Volodymyr was the ruler of the Kiev Rus’ kingdom from the late 10th century until the year 1015. Kiev is today the capital of Ukraine with about 4 million inhabitants. The country itself has about 45 million inhabitants. It’s one of Europe’s largest country, but unfortunately overshadowed by its huge neighbor, Russia. The early history of the Kiev Rus’ kingdom is very interesting. In the beginning it was actually founded, to a large extent, by Viking settlers coming from Sweden. The Swedish Vikings went eastward (the Danish and the Norwegians went westward) and this led to many places of Eastern Europe becoming colonies and settlements ruled by these Vikings. There’s a theory that the Vikings that founded Kiev Rus’ in the 9th century originated from the region of Roslagen, the coastal area of the province Uppland of Sweden (where I’m at). The name of Kiev Rus’ should by this theory come from Roslagen. Kiev Rus’ later became a vital part in the founding of the Russian empire, or Rossiya. It’s quite a funny thought that some people from Sweden in the 9th century are the cause of Russia bearing its name of today. Let’s continue with Volodymyr. On the coin he’s holding a cathedral – symbolizing the fact that it was Volodymyr that introduced Christianity to Kiev Rus’ and other parts of Eastern Europe. 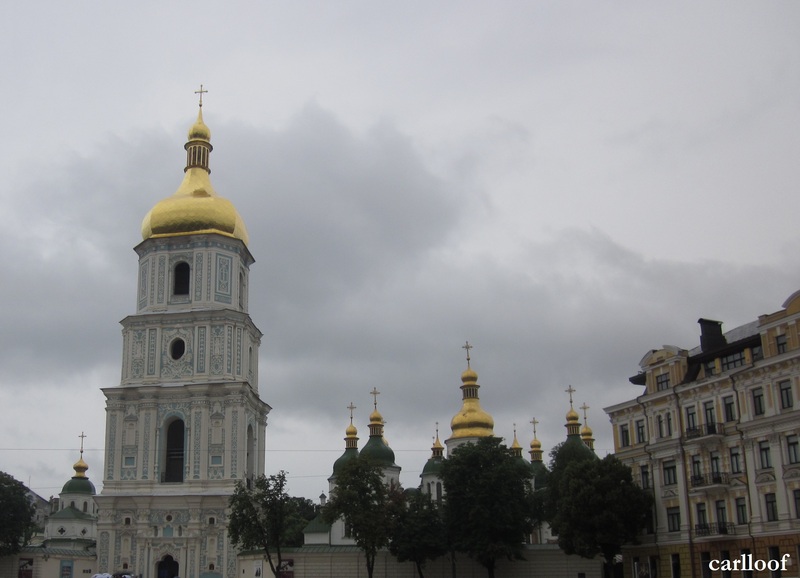 The cathedral does actually exist in reality, in Kiev. Its name is Sofiyskyi sobor (Saint Sophia Cathedral) and it was Volodymyr that decided that it would be built. Saint Sophia Cathedral is a UNESCO world heritage site since 1990 and it’s as beautiful outside as it is inside (but you’re not allowed to take photos inside). I’ve got first hand experiences from this cathedral because I visited it last year, and it was amazing. 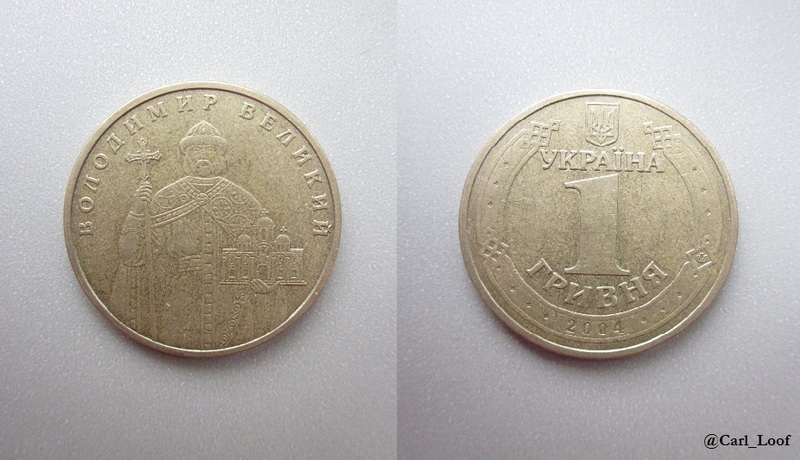 Ukraine is a country with a lot to offer – both for travelers and coin collectors! Charles Darwin, the father of evolution, was born in 1809. This 2£ coin was minted in 2009 commemorating the birth of this very important scientist. The obverse side features Elizabeth II who’s been queen since 1952. 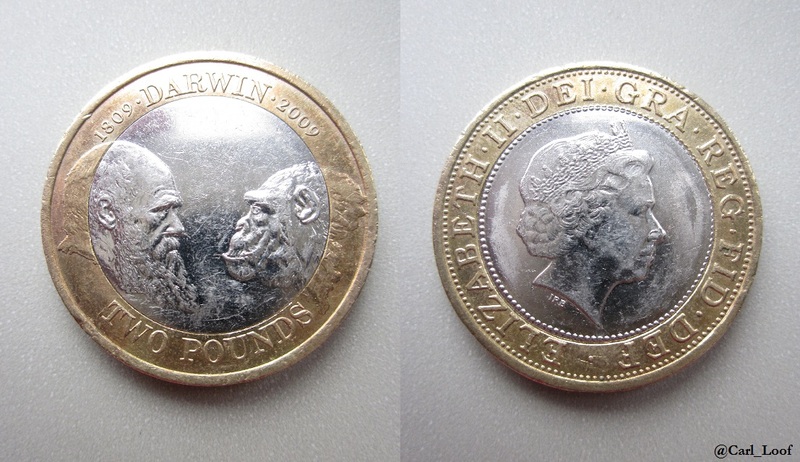 The reverse side features Charles Darwin face to face with, the origin or our species, a chimpanzee. Of course, humans haven’t evolved from chimpanzees but according to Darwin’s theory we and other primates share the same ancestors. Darwin and his theory were despised during his lifetime and it wasn’t until the 20th century that his ideas were taken seriously – when they became the truth. This coin was one of the first ones I managed to get my hands on during my visit to London earlier this year. 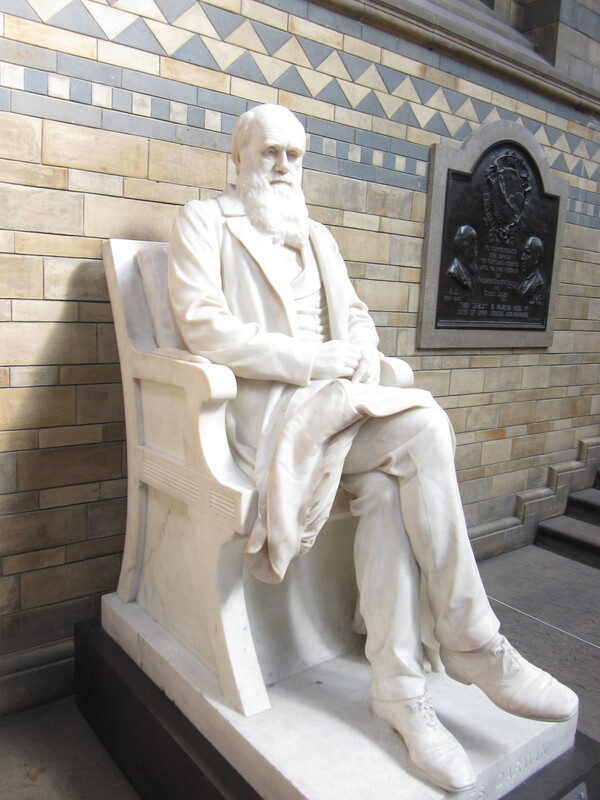 And later during my stay there I met Darwin again – now as a huge statue inside the Natural History Museum.